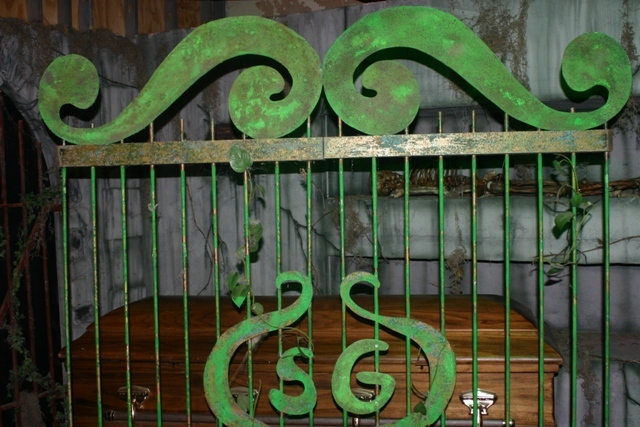 Wolfman Mac’s Chiller Drive-in Open House: The Gates of Sir Graves Ghastly! As Mac entered the Open House, I noticed him generate the same fanfare and excitement I had witnessed during his appearance at Horrorhound. Crowds of people enveloped him as Mac happily posed for pictures. A short time later, he noticed me across the room and waved. 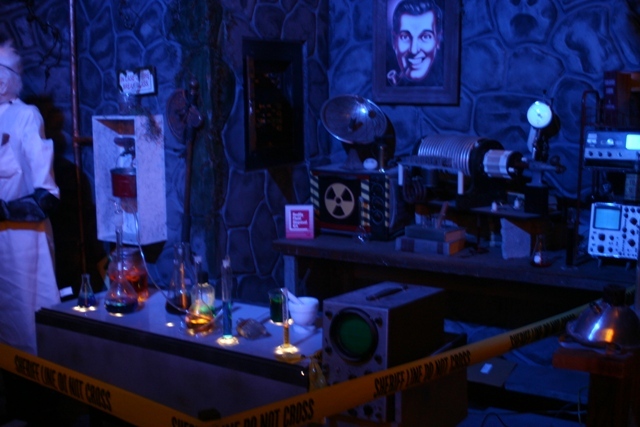 He then took a short-cut over to the “Projection Room” set where he would formally greet his guests. “The Chiller Drive-in” is divided into four sets. Across from the concession were three additional venues for Mac and his fellow cast members to carry out their signature story-lines. 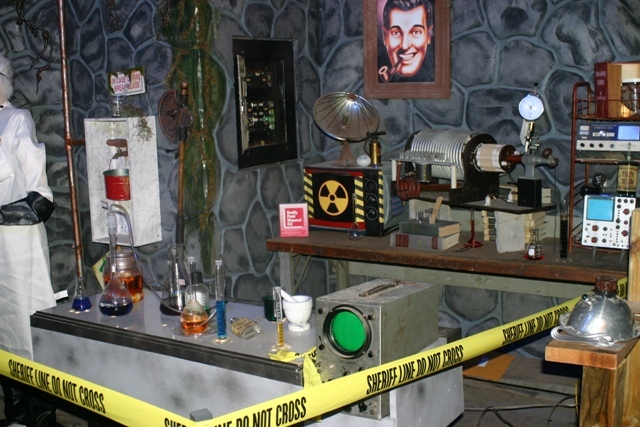 On the far right was a faux laboratory complete with its own mad scientist. 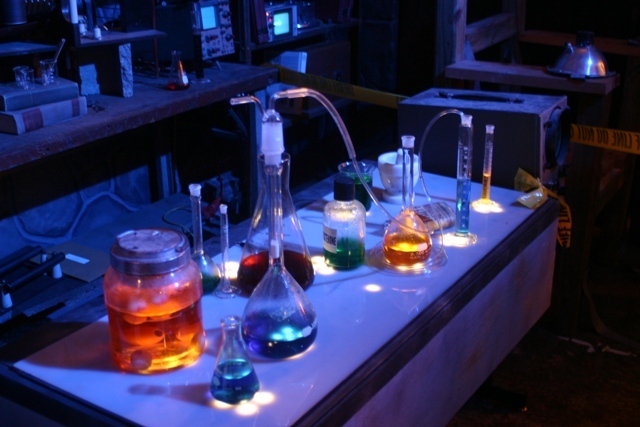 The table was littered with science beakers containing unknown liquids that appeared even more diabolical via illumination. To the left of this set was The Projector Room, where Mac greeted fans and made numerous announcements. I had seen this room many times while watching the show and always enjoyed seeing the great embellishments that, literally, covered its walls. What I did not know, however, was how much history existed here. 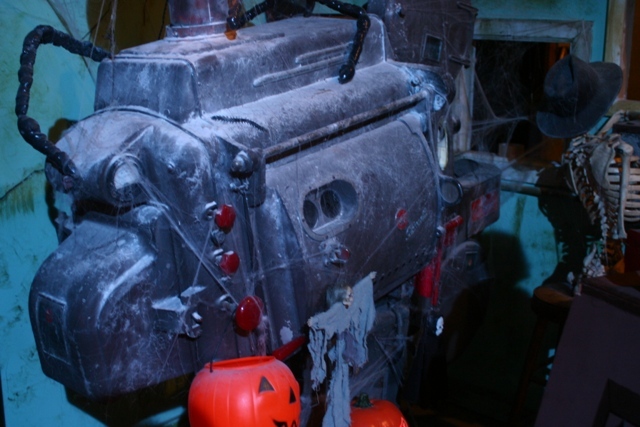 While “The Chiller Drive-in” is, in itself, a tribute to a bygone era of our cinematic history (even peppering it’s own show with public domain clips of drive-in advertisements and messages to its patrons), I discovered during the open house that it actually goes much deeper than this. 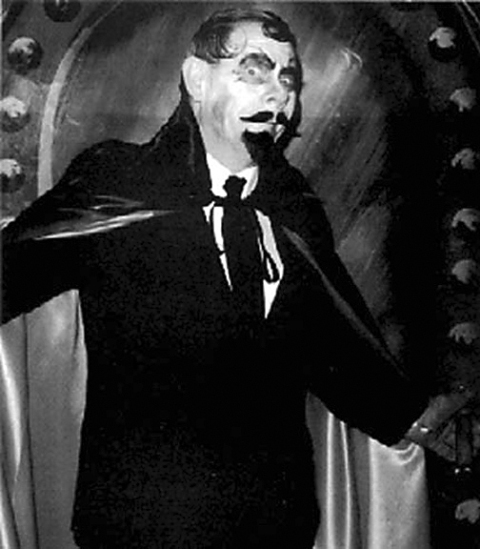 Notice the mask of Ohio horror host “The Ghoul?” This classic host also enjoyed a run on Michigan television. Sitting in the room is an actual projector from a vintage Michigan Drive-in. As my brain tried to register all the amazing sights in the room, a friendly crew member invited me to come on in and take as many pictures as I’d like. The man’s name was Todd Vierk and he is part of the drive-in’s creative team. While I ogled the enormous projector, Todd explained that it was from the Gratiot Drive-in from Roseville, Michigan (east side of Detroit). 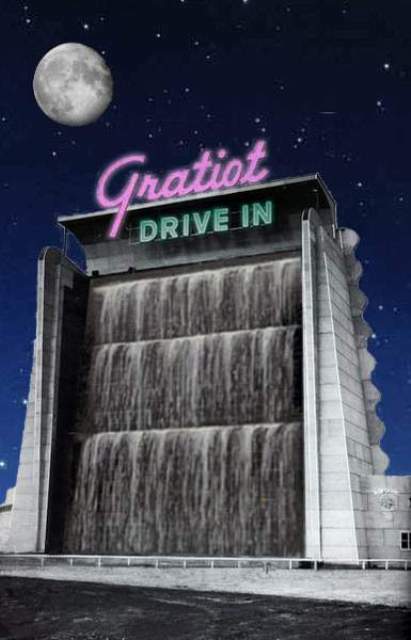 The Gratiot Drive-in, which opened in April, 1948 was billed as the world’s largest drive-in, featuring free pony rides, merry-go-round and other playground amusements for the kids, a large restaurant that even warmed baby bottles on schedule for patrons, and a living curtain waterfall illuminated by colored lights to simulate Niagara Falls. The Gratiot Drive-in opened in 1948 and closed down in 1984. “If you drive there now it’s a big Sam’s Club and strip mall, ” said Todd, “it’s really kinda sad.” While the site was demolished a short time after its closing, some of its artifacts live on at “The Chiller Drive-in.” Along with the immense projector, there are also original film canisters containing actual movies shown during it’s 36 year tenure. “We’re not sure what movies these are,” said Wolfman Mac. “For all we know it could be GONE WITH THE WIND and we’re spilling Pepsi on em’ every week.” Mac’s jesting aside, I could tell that he, as well as the entire cast and crew, viewed these items as sacred. 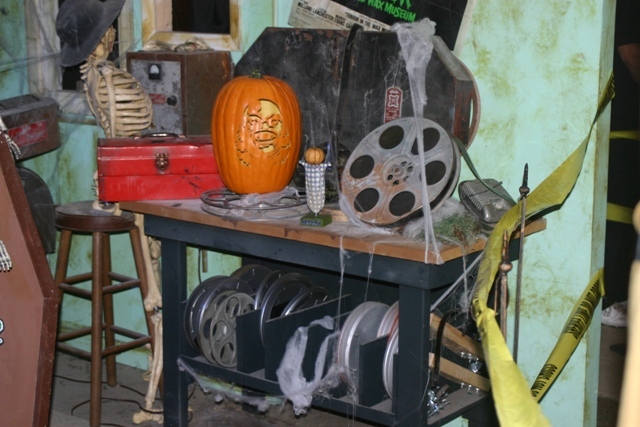 To the left of the projection room, is a smaller set designed as the crypt for the Drive-in’s newest cast member, Scary Grant (see previous entry). Despite its recent addition to “The Chiller Drive-in,” this set boasts an amazing bit of local history itself. 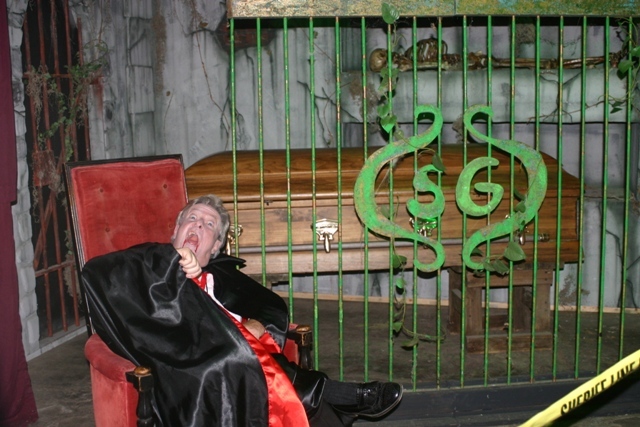 Scary Grant (Rick Bobier) lounges in his new abode. 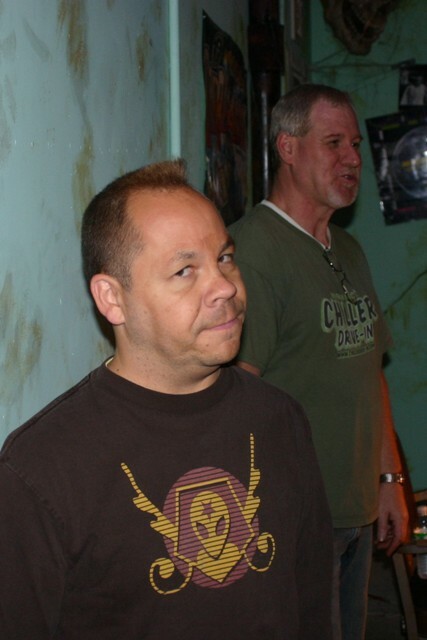 While Ohio’s, The Ghoul (Ron Sweed) enjoyed a healthy tenure on Detroit air waves, Michigan already had a classic host of its own. 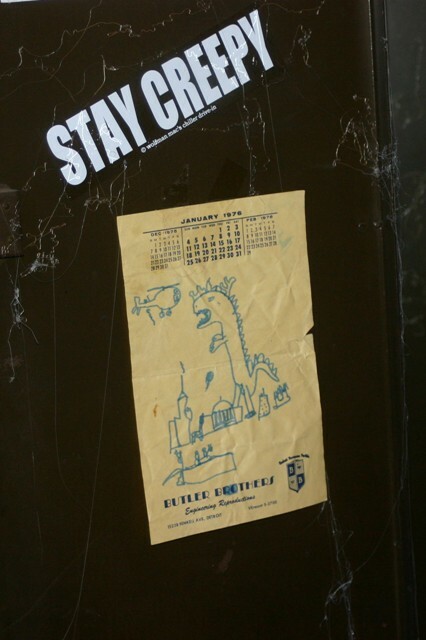 Sir Graves Ghastly (Lawson J. Deming) reigned supreme from the late 1960’s into the early 1980’s. 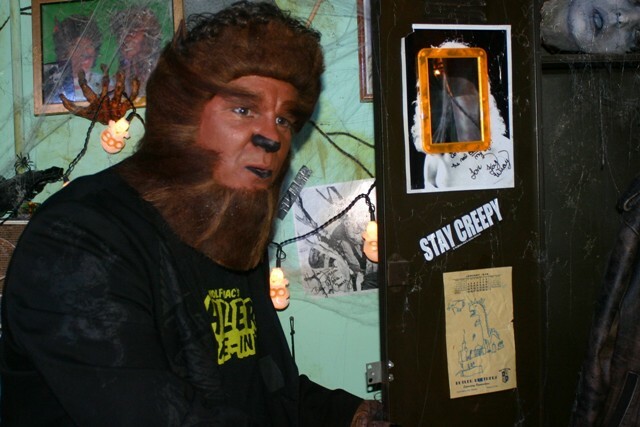 His legion of fans include many of “The Chiller Drive-in” crew members as well as Wolfman Mac himself. Mac shows us a drawing he had sent to Sir Graves, back when he was a childhood fan. Tune in next time as I focus on meeting Wolfman Mac, as well as the most talented ogre you’ll ever meet…. 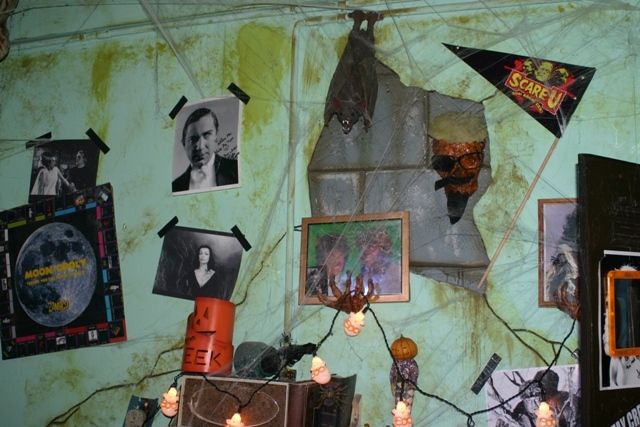 This entry was posted in Horror Hosts and tagged BONEY BOB, Drive-in movies, Gratiot Drive-in, Lawson J. Deming, Sir Graves Ghastly, The Chiller Drive-in, Wolfman Mac. Bookmark the permalink. 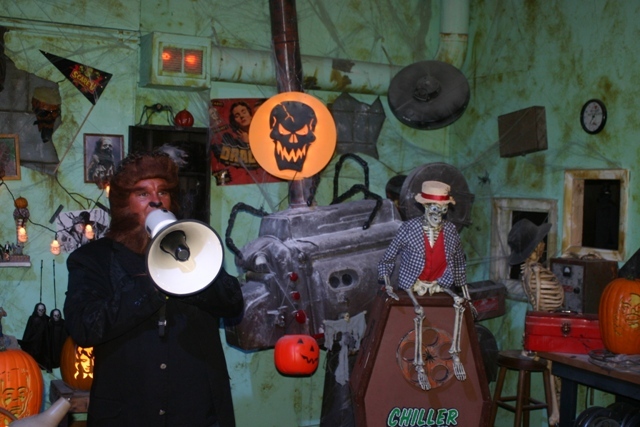 ← Wolfman Mac’s Chiller Drive-in Open House!